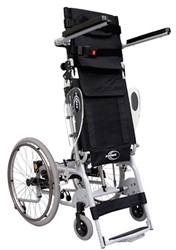 Manual Wheelchair with Power Stand-Up features an easy pushbutton control to elevate from a seated to a standing position. Memory Foam back & seat cushions and 2 U1 Batteries included! Power Wheelchair with Power Stand-Up features an easy-to-use SHARK II controller. Stand-Up Power Wheelchairs are controlled by a joystick which allows for easy maneuverability anywhere you go. These power wheelchairs are designed for durability as well as comfort. They also offer many health benefits such as increased blood circulation, kidney and bladder function, and muscle tone improvement.